This at a press conference on January 5 said the head of the State Migration Service of Ukraine Maxim Sokolyuk. January 11, 2016 Migration Service launches introduce passport Ukraine in the form of a plastic card (in European countries this document is called ID-card). Maxim Sokolyuk stressed that the migration service starts deep reform, and therefore is aware that in the first months of errors. Therefore, representative established DMS on Facebook, provided an opportunity to communicate with the central office and regional authorities in Skype, and created a special e-mail (rd@dmsu.gov.ua) for suggestions of citizens on improving territorial divisions. DMS Chairman said that the first stage to the Verkhovna Rada the bill number 3224 "On Amendments to Some Laws of Ukraine on documents certifying the citizenship of Ukraine, of identity or her special status", a new document oformlyuvatymetsya free citizens who have reached 16- age and shall issue a passport of citizen of Ukraine for the first time. "Migration has more than 600 subdivisions all over Ukraine. We purchased equipment distributed evenly throughout so that citizens do not have discomfort during registration. To date, approximately 800 workstations in 330 units migration service across the country are equipped with this equipment, "- said Sokolyuk. In addition, he noted that the procedure for the replacement of old passports in the form of booklets on the ID-card is necessary to Verkhovna Rada passed a government bill №3224. The head of LCA expressed the hope that this law will Parliament in late January or early February. In units where such equipment does not, citizens will be issued temporary passports old-style (booklet). Citizens applying for a passport of citizen of Ukraine for the first time (for example, due to loss or damage), as to bill №3224 passports will be issued to the old model. The new document will be issued to citizens of Ukraine Ukraine instead of passport (booklet) are much more protected from forgery and is designed to confirm the identity and citizenship in Ukraine. With an integrated electronic contactless chip, introducing ID-card opens up new opportunities for development of electronic services and the simplification of administrative services. On the chip will be written personal and biometric data document holder, including residence and marital status. Adding digital signatures and other data is technically possible, but needs legislative regulation. Together with the introduction of ID-cards, Migration Service carry out filling the Unified State Register of demographic - electronic database on which will be the identification of individuals. The experience of European countries, the process of documenting citizens' ID-cards will last 4-5 years, during 2016 Migration Service expects to issue 2 million new sample documents. Following the adoption by the Verkhovna Rada bill number 3224 Migration Service will be able to issue passport to all citizens of Ukraine. 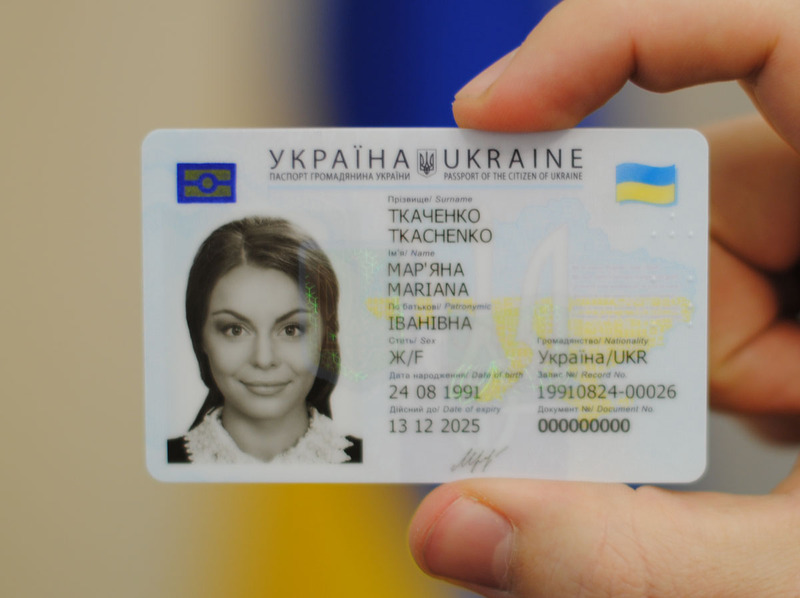 Mandatory replacement passport of citizen of Ukraine to document the new model is not provided, so the citizens does not make sense to rush to obtain ID-card. To obtain a first passport of citizen of Ukraine to reach the age of 16 should contact the DCC unit residence and to provide a birth certificate. If the ID-card registration (if technically possible) photographs provide not required.